Karl Lagerfeld is a world famous fashion designer, he has become famous for his cooperation with Chanel, Chloé and Fendi Fashion Houses. 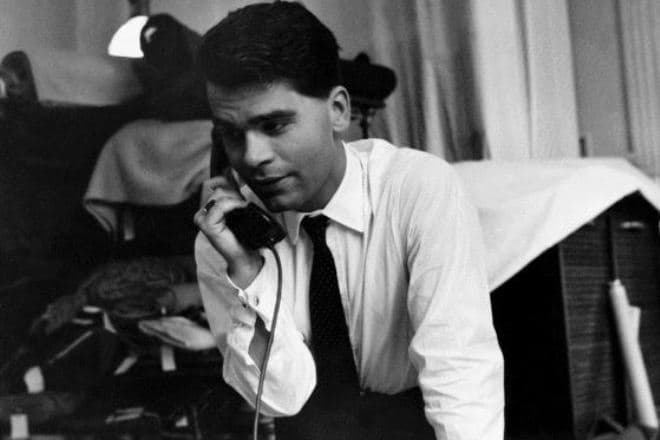 Karl Otto Lagerfeld was born in September 1933 in Hamburg. But the couturier himself claims that he was born in 1938 and Karl can prove it. The boy's father Otto Lagerfeld was a prosperous bank employee. At the time of his birth his mother, German by the origin was 42 years old, and his father who had Swedish roots turned 60. The boy was the only son in the family, but he has two stepsisters. When Karl Lagerfeld was 14 years old, his parents moved to Paris. From their consent their son went to study at Haute Couture School: already in Hamburg, the young man had shown his talent for the clothing design. In this educational institution for young fashion designers, Karl got acquainted and made friends with Yves Saint Laurent. The first creative victory of Karl Lagerfeld is dated with the year 1954. Then the International Secretariat of wool organized a competition by results of which 21-year-old guy (according to Lagerfeld he was 14 at this time) got the first prize for the best sketch of the coat. After that occasion, Karl was invited to the well-known Pierre Balmain Fashion House where the young man had been gaining experience for 4 years. In 1958 Karl Lagerfeld was invited to the Jean Patou Fashion House, where the designer had worked for 4 years as an art director. Having been disappointed in the world of haute couture, the young couturier left Paris and went to Italy where he began to study the history of arts. 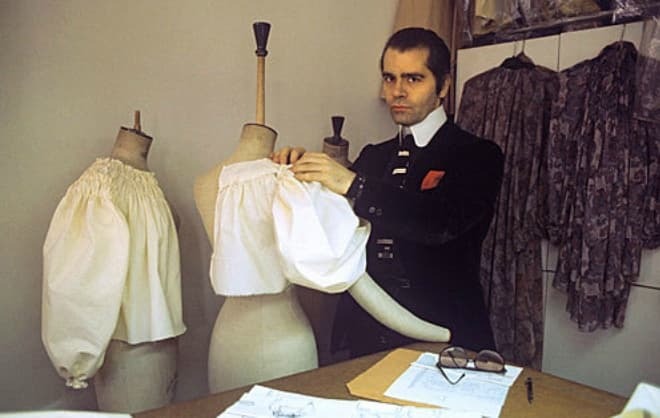 But there Lagerfeld suddenly understood that he had left the world of fashion too early: actually he wasn't disappointed in it, and just was fed up with monotony. Lagerfeld continued his creative biography in mid-sixties. Karl as an independent designer had worked for four Fashion Houses – Chloé, Krizia, Charles Jourdan and Fendi. The uniqueness of this fashion designer was in the fact that for each brand Karl created exclusive models which were different from each other. In 1974 the designer released his own first fashion clothing line for men and at once received the invitation to become the professor of the Vienna School of Applied Arts. In 1980 Lagerfeld invented fashion for skirts - shorts and miniskirts. But the designer became extremely famous three years later when Karl became the art director of Chanel Fashion House. During this period the fashion designer created the line of ready-to-wear clothes. A little bit later new fashion clothing lines appeared - "KL" and "KL by Karl Lagerfeld". The talented fashion designer managed to transform the old-fashioned Chanel style into something dynamic and modern. In 1986 Karl Lagerfeld received an honorary award of Golden Thimble for the new collection of this brand. In the late nineties, Lagerfeld's style became closer to famous Coco Chanel's style. The suits and evening gowns patterned in the style of "belle epoch" gain world glory. At the same time, there was formed the individual style of Lagerfeld - his dark glasses, a classic men's three-piece suit of black or grey color and leather gloves- mitts. Karl Lagerfeld sticks to this style till present times. In his own collections, the fashion designer likes to use leather and fur, with what he repeatedly caused angry protests from the animal activists. In 2001 the scandal burst out with the participation of PETA organization activists. Since then the couturier produces only one sable fur coat in a year whereas in former times the number of fur products amounted in hundred pieces. There are also accessories in the product range released by Karl Lagerfeld. The fashion designer annually renews collections of women bags, releasing small, medium and volume items which photos later are posted on the official web. Claudia Schiffer, Diane Kruger, Stella Tennant, Cara Delevingne became the favorite top models of the designer. The girls, each of them in a due time, became the central figures at the fashion parades of the maestro. Also, Vanessa Paradis, Keira Knightley, Inès de La Fressange participated in the photoshoots of the fashion designer. In addition to his design popularity, the fashion couturier became famous for his talent of the photographer. For this Karl was awarded by the prize of Lucky Strike Designer Award and an honorable prize of the German Community of Artistic Photography - "Deutsche Gesellschaft fur Fotographie". After these victories, Karl Lagerfeld's Gallery was opened in the fashion capital. One more gallery under the name "Studio 7L" was opened sometime later. This gallery became famous for the fact that in a year there were created 10 new clothing collections. The tireless designer admitted that at that time he was sleeping only for 4 hours a day. Karl Lagerfeld is the big fan of books. In the private library of the designer, there are 300 copies of the books. The fashion designer founded "7L" publishing house on his own behalf, here there is a bookstore. In 2000 Karl offered for the auction a part of his own collection of editions about the art of France of the XVIII century. One more hobby of the maestro is the creation of the exquisite perfume. Since 1975 Karl Lagerfeld releases perfumes of Chloé, KL, Jako brands. The fragrance which smells like a book became favorite perfume of the fashion designer. 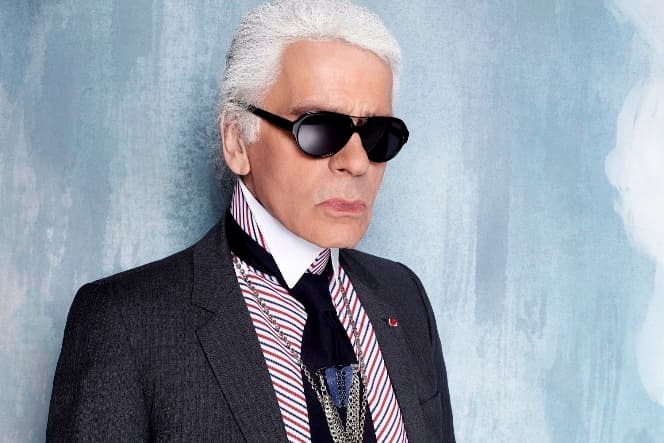 Many contemporaries call Karl Lagerfeld the emperor of the fashion world. In his advanced age, the designer is tireless and refuses to retire. The last quarter of the century the fashion designer occupies the post of the creative director of Chanel Fashion House. Lagerfeld dresses the Hollywood stars and doesn't forget about his second hobby which is photography. In 2007 there was a movie "Lagerfeld Confidential" devoted to the designer which was directed by Rodolphe Marconi. The first display of the picture took place at the International Film Festival in Berlin. Seven years there was a premiere of the feature movie "Yves Saint Laurent" where Nikolai Kinski appeared in the image of Karl Lagerfeld. Also, there are two more documentary films dedicated to designer’s creative work. It is considered that the couturier has a non-conventional sexual orientation. Karl was never married and has no children. Personal life of Karl Lagerfeld is a love affair with his best friend Jacques de Bascher who died in the late eighties. After Jacques's death, the designer hadn’t had any relationships. The fashion designer answers questions of personal character saying that his beloved had died, and "everything was over". Lagerfeld doesn't love questions about his personal life, claiming that at such mature age it’s indecent to speak about such things. Now in the house of the fashion designer, there are three persons constantly – the housemaid, the cook, and the driver. From time to time Karl Lagerfeld keeps himself in line with the scandalous statements which are later discussed in the press for a long time. For example, the couturier is extremely critical towards the obese women. The fashion designer claims that nobody wishes to look at the plump women. The only occupation of such persons is to sit in front of the TV screens with chips and to discuss the ugliness of skinny models. 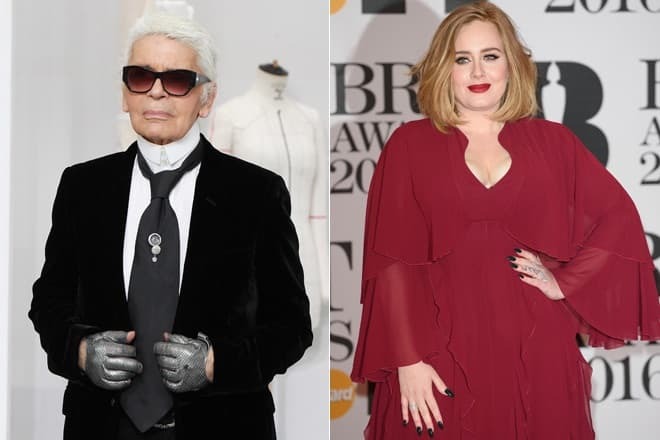 Lagerfeld even had to apologize for some of his statements as it happened in 2012 to the favorite singer of British people - Adele. Karl called the girl too fat, though he paid attention to her "divine voice" and to her beautiful facial features. In other interview Lagerfeld criticized the Russian men, having told that in the majority they are "the real freaks". But the couturier called Russian women the most beautiful in the whole world. The master of fashion added that in the place of the Russian beauties he would prefer non-conventional sexual orientation. One more scandalous statement of Karl Lagerfeld concerned children. The designer said that paternity was the last thing that he had ever wanted. And in general, the fashion designer hates children because "he was born a non-family man". The quotes of the maestro quickly became popular and they are at once picked up by the glossy editions. During the year 2017 Sébastien Jondeau, the former model, who during 20 years was a personal bodyguard of the designer was working on his own fashion collection under Karl Lagerfeld's patronage. The presentation of the fashion clothing line of Lagerfeld's pupil is set for spring of 2018. On the eve of the 80th anniversary (or the 85th anniversary) in 2018 Karl Lagerfeld together with the cosmetic Australian ModelCo brand started his own line of decorative cosmetics which consisted of transparent lip gloss, shadows, blush, powder, and mascara. On the 19th of February, the eminent fashion designer Karl Lagerfeld died at the age of 85 in one of Parisian hospitals. According to the information provided by his representatives, he felt bad during two weeks before his death. Lagerfeld was taken to the hospital on Monday suffering from pancreatic cancer. Karl was concealing his disease and was struggling bravely against it. During latest time, he didn’t appear at the fashion displays which he was expected to attend.